We’re speeding down a river in Tortuguero National Park, a pristine 77,000-acre protected area at the heart of efforts to conserve the remarkable biodiversity in Costa Rica’s northeastern Limón Province. We’re far from anything you’d call “civilization,” over 2 hours by boat from the nearest road, in remote rainforests that receive up to 250 inches of rain a year. Tortuguero National Park is a poster child for Ecotourism in Costa Rica– a haven for nature lovers eager to get away from it all. My eyes scan the dense thicket of trees that line the river, scoping for signs of movement amidst the verdant green. 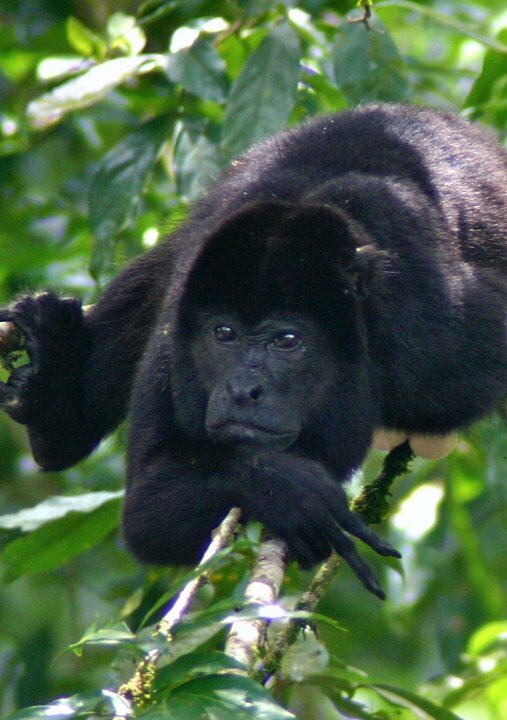 I crane my ears to listen for the unmistakable call of Howler Monkeys. I see nothing. I hear nothing. Suddenly the boat stops, reverses and heads straight for the forest to our left. As we get closer I spot a brown lump camouflaged by the brush right at eye level. Only when we’re within 20 yards do I realize it’s a Three-toed Sloth. 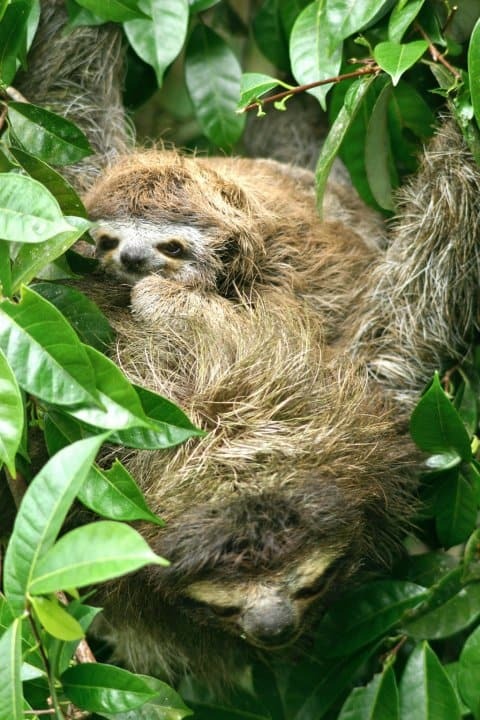 We’re within 10 yards before we notice the furry lump on top of the Sloth, and everyone lets out a collective gasp as we realize it’s a mother and baby. The boat inches closer and closer until my daughter could easily reach out and touch the sloth. She doesn’t, but the mama seems unconcerned by our presence. She checks us out briefly, then goes right back to munching her leaves. Five minutes later, we’re close enough to an 8-foot Crocodile that my daughter could jump off the boat and onto its back. She doesn’t. To an 8-year-old, phrases such as “deforestation” and “endangered species” seem like abstract concepts. Our educational system ensures that third graders know the terms well enough to define them on a multiple-choice test. But when even grown-ups can’t agree on simple scientific principles such as evolution and global warming, how can we expect our children to fully understand the role their generation will play as stewards responsible for the Earth’s ecological and environmental future? 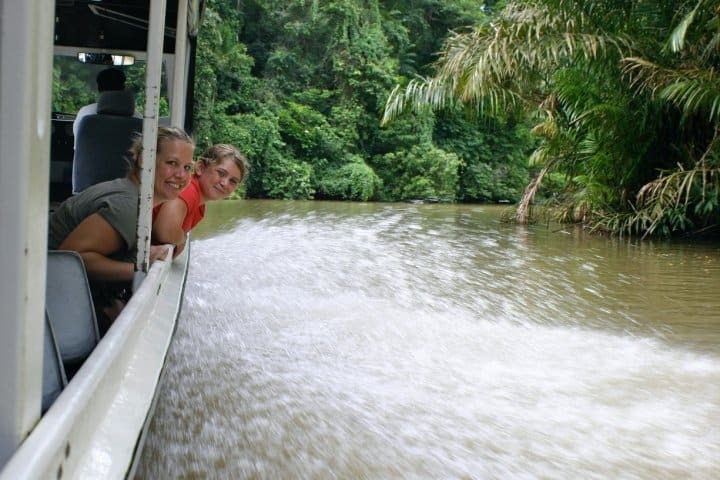 That’s why I’ve brought my family to Mwamba Lodge, an ecotourism haven situated on a sand bar dividing the canals of Tortuguero from the Caribbean Sea. 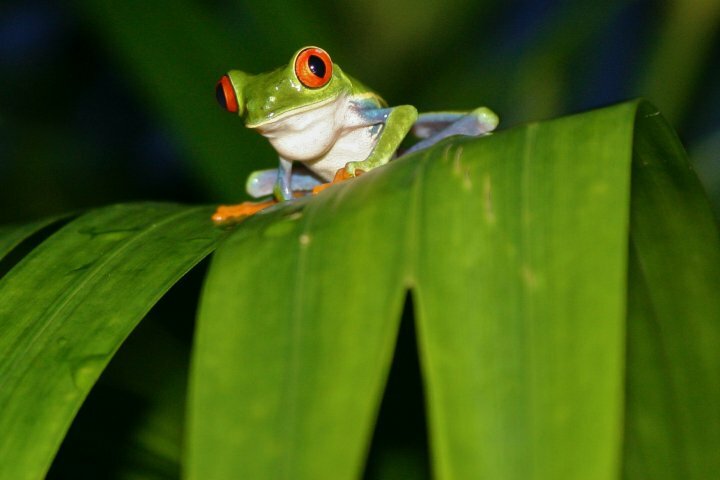 The remote lodge is rustic and luxurious, offering spacious rooms surrounded by a rainforest teeming with birds, butterflies, lizards and frogs. 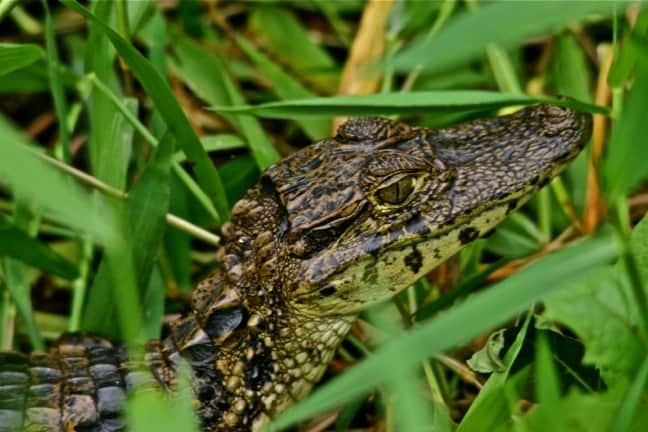 Tortuguero National Park is an animal lover’s paradise, with nighttime tours in search of sea turtles coming on the beach to nest producing spectacular views of star-lit skies. In the mornings we explore the canals, getting up close and personal with baby Caimans, camera-shy River Otters, Toucans, Tiger Herons and Roseate Spoonbills. 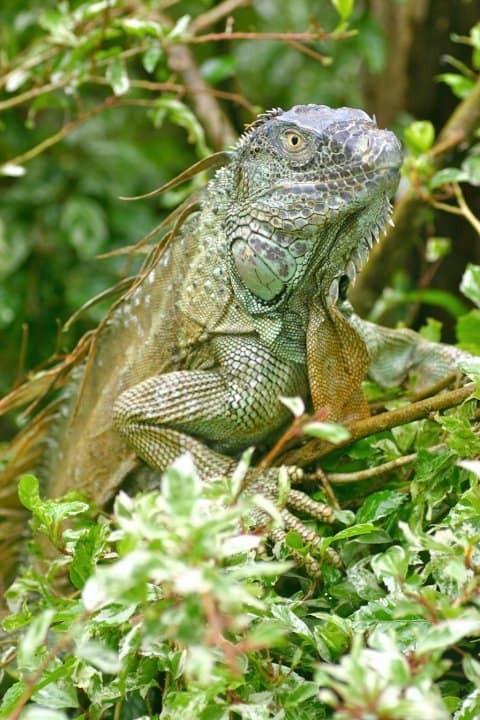 Afternoon walks in the dense woods of Tortuguero National Park feel like stepping into scenes from Jurassic Park. It’s a taste of nature as primitive and unspoiled by human intervention as anything I’ve even experienced, and the sight of wonder in my child’s eyes tells me she gets it, even if only on a subconscious level: THIS is what we must fight to preserve. Departing Mwamba, we make the 6-hour journey to Hotel La Quinta de Sarapiqui. This nationally certified eco-lodge is our base of operations for the second leg of our trek. Their 10-acre property isn’t as rustic or remote as Mwamba, but is equally full of wildlife. It also offers the welcome blast of A/C after days of high heat and humidity. From there we explore nearby Tirimbina Biological Reserve, which offers educational and research opportunities for scientists and tourists alike. Their guided walks through 9 km of hiking trails offer a wealth of information about the remarkably diverse flora and fauna, subtly emphasizing conservation and sustainability. Their massive suspension bridge, which takes you over raging rapids and through the forest canopy, reinforces the message beautifully, offering exceptional views of howlers moving through the treetops, sloths taking afternoon naps, and myriad birds and insects. After a week in Costa Rica, it seemed almost impossible for any of us to sum up our wild, wonderful experiences there. How do you describe the feeling of petting an alcoholic boar on Tortuga Island, riding in an aerial tram 200 feet above the rainforest floor during a torrential downpour, or watching spider monkeys leap from tree to tree? I’m not sure how much of an impact the trip will have on my daughter in the long run. But I do know that it’s important to encourage kids to protect our planet’s precious natural resources.